Uyuni is the kicking off point for trips into the Salar de Uyuni, the largest salt pan in the world and a must on most visitors’ itineraries to Bolivia. The trip out to the lake also usually includes the dramatic landscape to the south of the lake, with is filled with volcanoes, salt lakes and geysers and takes about three days. I was a little apprehensive about booking a tour because of the many ‘bad trip’ stories I’d heard, drunk drivers, broken down vehicles, crap food and other rip offs. Everyone I’d met said that the fantastic scenery outweighed the problems but that you had to be careful who you went with. Having just returned from a three day trip where I had a wonderful time here are a few tips. Firstly don’t book your tour anywhere else but Uyuni, there are now 62 tour agencies in town and the prices are very competitive. Booking anywhere else means you will pay more. I paid $70 for a three day trip including food and accommodation. In Uyuni there is a company that ranks the tour operators for quality, they were set up as an aid project but now fund themselves with a café and shop. They are impartial and will only take recommendations from travelers, not the companies themselves. The company is called ‘Ranking Bolivia’ and they can be found at Potosi 9, in Uyuni. The tour situation is changing all the time and the guide books are usually very out of date. Go to Rankings to find out who is currently giving a good deal. I traveled with a company called ‘Oasis Odyssey Tours’, which was near the top of the ‘best of’ list. Note that many tour operators are shut on Sunday including many of the better ones. Oasis turned out to be an excellent choice, mainly because we had an excellent guide. His name was Javier Canaza who was the driver guide and his wife, Liset who was the cook. Its worth asking for him by name as guides often work for a couple of tour agencies. Javier only speaks Spanish, but almost no guides speak English. If you want an English speaking guide you will have to arrange it in advance and pay about $20 a day extra. Liset was an excellent cook with fresh, hot food served up at every meal. There were no problems or breakdowns during the trip. All the agencies use Land Cruisers, the one I traveled in was in better condition than others I saw. I did see one group that had to borrow a spare tyre from another Land Cruiser and we passed another group who ran out of gas on the way back, just 10k from Uyuni! Combining groups is very common; two people on my tour had booked with someone else. Do check the vehicle before you set out, see that it has a spare and a full tank of gas and if it looks bad insist on another one. I did see most of Oasis’s stock of Land Cruisers and they all looked pretty good. Be advised, these trips are not for people who want their comforts. Most tours take six or seven people so it can be a little claustrophobic. Who your tour companions are is up to luck, I was fortunate to have some very nice people on mine. Three days cooped up in the same vehicle could be a problem if you don’t get on with people. If your tour is taking seven, it means that the driver/guide will also do the cooking, so don’t expect anything too elaborate to eat. The accommodation is also very basic, with dorm rooms, simple bathrooms and no heating. Power is from generators and it goes off at 2100. If you don’t have a sleeping bag you can usually hire one from the agency – do so, also if you don’t have warm clothing – buy some. The second nights stop is at 4300m and you will wake up to find water in bathroom frozen. The third days start is at 0530 with the temperature well below freezing. Most of the tours follow the same route so that there will be eight or ten Land Cruisers at the lunch stops and at the main Miradors. As there are no toilets most of the main stops double as large open air latrines, so watch your step when you walk around corners. So is it all worth it? No doubt at all. The Salar de Uyuni is one of the worlds great sights, a great expanse of nothingness. Every guidebook has a picture and you will take lots too, so take plenty of batteries (you can charge them along the way but it’s difficult) and film/memory. The Volcanoes and lakes are very spectacular but perhaps the most enduring sight is that of so much wilderness (if you exclude the other Land Cruisers). There is also some wildlife like wild Vicuñas (primitive llamas), Vizcachas (giant rabbits) and a semi tame Andean Fox at one of the lunch stops. Seeing the Milky Way at night, when there is no light and Mercury rising in the early morning, things most of us never see, these are all bonuses. One thing you must do, although many people chicken out, is to have a dip in the thermal baths. You will reach these at 0700 on the third day when it is still very cold, but believe me it’s worth it. The water is about 30 c but you stay warm after you get out. It’s a highlight of many. Since getting back to La Paz I’ve met up with a few people who did not have such great trips, two people in hospital (one with altitude sickness), two cameras lost, moldy bread and generally crap food being served up, and guides that seemed to be total bastards. The prices paid bare no relation to what people got, some paid a lot and got rubbish. Grinding down the prices does mean that companies will cut corners, and maybe this is the whole problem, too many people chasing too few tourists. What Uyuni needs is a shake out so that only the best survive, Rankings is at least a step in the right direction. Excellent advice - we're just about to head for Uyuni and will head straight for "Ranking Bolivia". Thanks for your advice. Will definitely ask for Javier..
Really helpful stuff... We´ll definitely head for Ranking and I think its likely we´ll go with Oasis as we just met another guy today in Sucre who suggested these guys... they had great food and an English speaking guide. Thanks so much! Nice story, I loved to read it and learn from it! Great post! 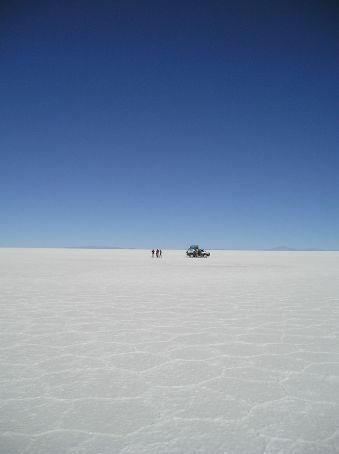 I'm heading to Uyuni now and know where I have to go to :) Thanks! But unfortunately the place Willian have been reccomended is not fair anymore that used to be. Some reports show that Ranking Bolivia has relations with some tour company and that is the reason why Ranking Bolivia is not a official site for tourist info anymore. Of course, they reccommend tour companies who paid for that good reccomendations. Formerly those guys have been receiving money from bolivian government to make a tourist info office in Uyuni, but with reports involving black business with some tour companies they where fired.